happy day after thanksgiving, folks! i am not one of those crazy black friday people who stand online at 4am – my black friday usually consists of a quick trip to the annual ‘sock sale’, and then a full day of baking. and usually my baking consists of some new recipes that i’m considering for my holiday cookie tray, but not quite sure will work. so, that’s my mission today! my first experiment is a recipe for these ‘sand’ cookies. since i continue my quest to duplicate that conti’s cookie recipe, and i would consider ‘sandy’ to be a good adjective to describe the much-sought-after recipe, i thought i’d give this cookie a whirl. my discovery was quite delightful. not what i was totally expecting, and not at all shippable (they are too delicate, and crumble too easily), but overall a very lovely cookie. soft and crumbly in texture, very delicate in both texture and flavor, these cookies work well at the top of your cookie tray, but would also be quite at home at a tea party! 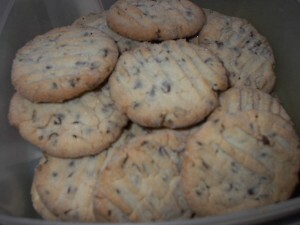 the mini chocolate chips add a nice spotted look to the cookie, and also a little extra sweetness. i think this cookie may be a keeper! …and for those of you keeping track of my conti’s quest, though the texture was closer to my beloved conti’s sprinkle cookie, i’m still missing the mark. but don’t fear, my experiments will continue!! 1. sift flour, baking soda, cream of tartar and salt together. set aside. 2. cream butter on medium speed for 3 minutes. with mixer on high, beat in oil, pouring it in a thin steady stream. mixture will be soupy. add baker’s sugar and confectioner’s sugar and continue beating for 2 more minutes. 3. on medium speed, blend in egg yolks and vanilla. the mixture will look slightly creamy. 4. on low speed, blend in 1/2 the sifted ingredients. 6. blend in rest of sifted mixture in 2 batches, beating just until flour is absorbed. do not overmix. scrape sides often. the dough will be very soft. 7. refrigerate dough for approximately 2 hours. 8. preheat oven to 375 degrees, and line your baking sheets with parchment paper. 9. using a tablespoon scoop, roll dough in a ball, then dip in the granulated sugar and place on prepared baking sheet. flatten each cookie lightly with the bottom of a glass dipped lightly in the sugar. 10. bake for 12-15 minutes or until set and golden, but not brown. 11. cool on pan for 1 minute, then onto wire rack.